Citizens in East Texas are becoming alarmed as representatives from ExxonMobil, operator of the Pegasus pipeline, show up to post yellow and black-striped warning markers along the pipeline route running across their land, the same one that ruptured about 320 miles northeast of there in March, spewing at least 210,000 gallons of heavy Canadian crude into neighborhood streets in Mayflower, Ark. Click here to read the article by the Texas Tribune that documents how normally conservative landowners are turning into activists in defense of their land and their homes. 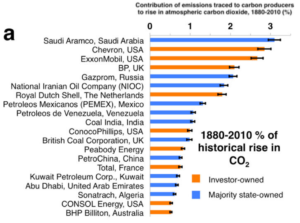 How Will ExxonMobil Adapt to Climate Change Crisis it Helped Create? On May 9, carbon dioxide (CO2) concentration in the earth’s atmosphere surpassed 400 parts per million for the first time since measurements began in 1958, according to National Oceanic and Atmospheric Administration (NOAA) scientists. Climate experts consider this to be the tipping point when unimaginable disastrous climate change is inevitable. 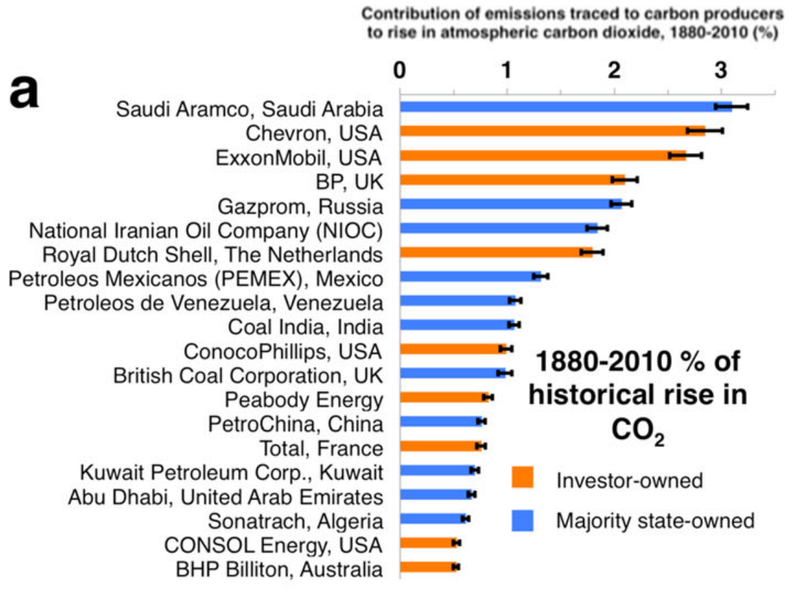 For years, responsible investor groups have called for ExxonMobil to address climate change. The company’s board of directors seems to hardly notice. Again this year, there are resolutions calling for greenhouse gas emissions goals. But a major shift in shareholder resolution themes is emerging. 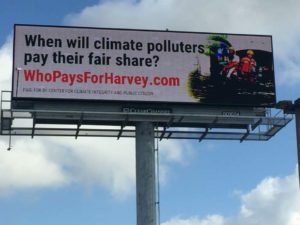 2013 shareholder resolutions call for ExxonMobil to disclose what the company is doing to adapt to extreme weather and climate change. This shift in resolution themes illustrates how neglecting to address climate change has contributed to a global crisis in which disasters are anticipated and preparedness for such events is a priority for any company’s business plan. Want of foresight, unwillingness to act when action would be simple and effective, lack of clear thinking, confusion of counsel until the emergency comes, until self-preservation strikes its jarring gong — these are the features which constitute the endless repetition of history. As I cast my votes this year, I hope that more shareholders will get involved to move ExxonMobil toward a life-sustaining future. ExxonMobil’s $44.9 billion in earnings for 2012 came close to a world’s record. Instead of wildcatting in costly, unproven non-conventional fossil fuel technologies such as fracking and tar sands that add greenhouse gas to the atmosphere, the company could show foresight and leadership by investing in clean, renewable energy such as wind, solar and geo-thermal. At the very least, ExxonMobil could invest some of its vast resources in best available technology to clean-up the emissions from its refineries and chemical plants. In addition to increasing CO2 levels, these emissions endanger the lives and health of the people living on the fence lines of these operations. 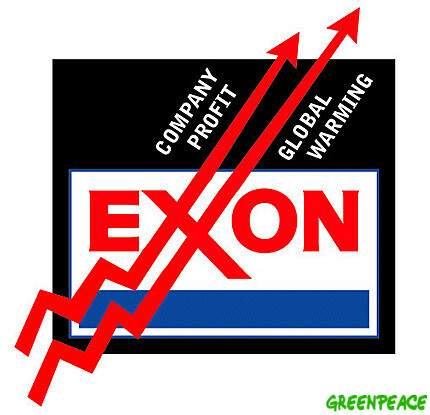 Unless citizens get involved, we can expect ExxonMobil to continue business as usual. 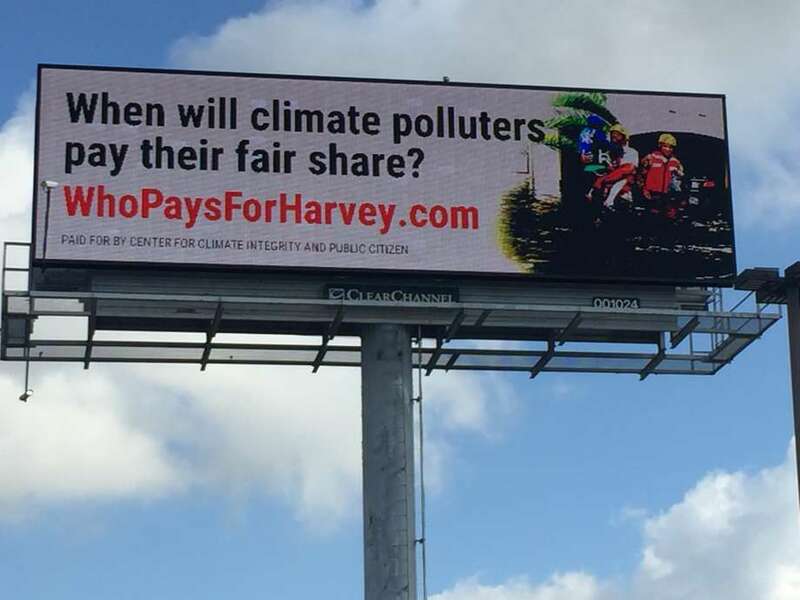 Of course we should expect our company to disclose to us it’s plan for adapting to climate change and how much it will cost. But I regret that this company, the U.S. government and others did not heed NASA Scientist James Hansen’s warning to the U.S. Congress about climate change in 1988. If action had been taken then, I believe we could have avoided much of the loss and suffering due to storms, fires and drought we recently have seen and are likely to see in the future. – Jane Dale Owen is granddaughter of Robert Lee Blaffer, one of the founders of Humble Oil and Refining Company, the parent company of Exxon Mobil. She is president and founder of Citizens League for Environmental Action Now (CLEAN) www.cleanhouston.org, an organization that provides news, information and education about global and local environmental issues. The recent Good Friday tar sands crude spill in an Arkansas neighborhood and an earlier catastrophic spill in Michigan highlight the dangers of transporting large volumes of tar sands crude into the United States through aging pipelines, warn Public Citizen and others. ExxonMobil Corp. is still cleaning up thousands of barrels of Canadian tar sands crude spilled from the aging Pegasus pipeline near Little Rock, Ark. Michigan residents are still dealing with the fallout from a devastating pipeline rupture in 2010. “Texas not only has the same 65-year-old Pegasus pipeline coursing through the state but also has the 34-year-old Seaway line, both slated to carry Canadian tar sands or diluted bitumen (Dilbit) crude,” said Rita Beving, Public Citizen consultant. The Pegasus and Seaway pipelines travel within a few miles of medical facilities, schools, churches and community subdivisions. Both pipelines cross tributaries and are within a few miles or underneath existing water supplies for many Texas cities (See Map of Pegasus Pipeline route through Texas and affected communities and List of affected communities along the Seaway Pipeline route through Texas). The Seaway passes near Dallas, and is slated to carry more tar sands crude than the combined pipeline segments of Keystone XL, up to 850,000 barrels per day. Not unlike other tar sands spills, the Pegasus pipeline spill near Little Rock forced the evacuation of people from dozens of homes. In 2010, the largest onshore spill in U.S. history occurred in Michigan, where a pipeline break on a 43-year-old pipeline spewed tar sands into the Kalamazoo River. This Enbridge Lakehead B spill resulted in residents being evacuated up to six miles away, as high levels of benzene and hydrogen sulfide became airborne and sickened local residents. More than 1.1 million gallons of tar sands or dilbit spilled into the river and traveled more than 35 miles along the waterway. Almost three years and $850 million later, the problematic spill is still not cleaned up, and Enbridge has now been ordered by the U.S. Environmental Protection Agency (EPA) to dredge the river. Children living near the Michigan spill reported cases of vomiting, upset stomach, shortness of breath, lethargy, headaches, rash, eye irritation, sore throat and cough within the first week. Adults experienced similar symptoms, and pets suffered from continuous vomiting and diarrhea. The EPA established that benzene levels in the area near the spill were exponentially higher than the standard established as safe for human exposure. The Seaway line passes within one to two miles of 8 medical facilities and nursing homes, 45 schools, 56 churches and dozens of Texas communities include Rockwall, Terrell, Corsicana and Royse City, Kaufman, and Baytown. Seaway crosses near tributaries of Lake Lavon, Cedar Creek Reservoir and beneath Richland Chambers Lake – all major water supplies for Dallas and Ft. Worth. The Pegasus line crosses into Texas northeast of Dekalb and travels within a couple miles of more than 29 Texas communities including Mt. Pleasant, Mt. Vernon, Winnsboro, Canton, Navarro, Polk and Livingston. Upon initial analysis, at least 16 schools and 12 medical facilities are within one to two miles of Pegasus. More than 14 lakes including Lake Cypress Springs, Bob Sandlin, Lake Fork, Cedar Creek Reservoir, Lake Halbert, and five tributaries of Lake Livingston are also crossed by the pipeline. Some of these water supplies serve as drinking water sources and are favorite recreational areas for sportsmen. Documentary filmmakers, Elliott Gilbert,II and Joe Capps, run into a cleanup crew in Mayflower, AR. Elliott Gilbert, a Dallas documentary filmmaker, and his assistant Joe Capps, rushed to the Arkansas spill site after it was discovered. Both commented to Public Citizen about visiting an Arkansas elementary school where they interviewed the principal, who had sent children home due to dizziness, nausea and vomiting. The school was within a half mile of the Pegasus spill. As the proposed Keystone XL northern segment awaits approval from the U.S. State Department and the southern segment is now being constructed in East Texas, many worry that repurposed pipelines carrying tar sands are the wave of the future. Beving notes that some companies, such as Enbridge, are twinning or adding additional lines to existing ones as they are doing with the existing Seaway pipeline. “Using existing pipelines and then twinning them is like building your own tar sands superhighway, an interstate for crude oil that you can expand at will with built-in condemnation rights. But this product is more toxic and problematic to clean up,” she said. Tar sands are mined and then diluted with natural gas condensate and a host of toxic chemicals, according to Chris Wilson, a chemical engineer who has consulted for Public Citizen. Tar sands or dilbit is up to 70 times more viscous, 20 times more sulfuric and 10 times more acidic than conventional crude. A shot of tar sands from the Arkansas spill pumped into a containment pond. This is a guest submission by Riki Ott, PhD. Dr. Ott is a marine toxicologist, author, and former commercial fisher. She was one of the first people on the scene during the Exxon Valdez oil spill, when millions of gallons of crude oil were discharged into the pristine waters of Prince William Sound, Alaska. For 23 years, she has been the voice and face of efforts for justice. She is the featured character in the award-winning film BLACK WAVE: The Legacy of the Exxon Valdez, a documentary that tells the tale of the battle between commercial fishers against the largest corporation in the world, Exxon-Mobil. In oil disaster after oil disaster, industry has repeatedly hidden the truth from federal agencies and the public about spill volume and extent of damages, including wildlife kills, ecosystem harm, and harm to worker and public health. This underreporting is done to minimize the spiller’s liability – often billions of dollars are at stake. If the oil industry is not held accountable for these costs, the costs are externalized and borne by the environment, local economies and businesses that depend on a healthy environment, individuals and families who suffer health consequences, and U.S. taxpayers. Riki Ott, PhD is asking the press to pose critical questions rather than regurgitate industry press releases. The public depends on the press in order to be well informed and make important decisions. It is essential for the media to search for deeper explanations and more accurate information during incidents that threaten human health, wildlife, and the environment––and future energy choices. Dr. Ott is offering this guide, based on her on-the-ground first-hand experience with the nation’s largest oil tanker spill (Exxon Valdez, 1989), offshore oil rig disaster (BP Deepwater Horizon, 2010), and on-land pipeline tar sands spill (Enbridge, 2010). WHEN WAS THE LEAK DISCOVERED? Exxon says the leak was discovered on Friday afternoon. What are residents saying? People living nearby should have known immediately from the fumes when the leak occurred or once it spilled above ground. In the case of the Enbridge tar sands oil spill in the Kalamazoo River (July 2010), residents reported smelling and seeing oil two days prior to the date Enbridge claimed the spill occurred. WHAT KIND OF OIL WAS SPILLED? Media is reporting a crude oil or sour crude spill. This oil is sour (containing high concentrations of hydrogen sulfide) but more importantly, it is heavy bitumen crude – tar sands oil (sour by nature) that has been diluted with lighter petroleum distillates and other very toxic chemicals.1 These chemicals are often labeled proprietary due to their toxic nature. WHAT ARE OTHER NAMES FOR TAR SANDS OIL? “Tar sands oil” is a political red flag, so the industry also calls it “nonconventional oil,” “heavy bitumen crude,” “dilbit” (diluted bitumen), and more recently, “sour oil,” and “sour crude”. Don’t fall for it. What spilled is the essentially the same stuff that Enbridge spilled in Michigan (July 2010) and that would be coming down the Keystone XL: tar sands oil (bitumen crude oil) with diluents, or dilbit. WHAT ARE THE HUMAN HEALTH RISKS OF EXPOSURE TO TAR SANDS OIL, DILUENTS, AND DILBIT? The diluents are industrial solvents, containing petroleum distillates and other toxic chemicals that that target and harm the same organs of the body as PAHs/oil––the respiratory system, central nervous system, skin, and blood. This means the body takes a double hit of toxic chemicals. Diluents contain chemicals that are teratogens (disturb development of or kill babies in the womb), carcinogens, mutagens, systemic poisons, and cause hemolysis (rupture of blood cells). Some people are more vulnerable than others to dilbit, especially children6, pregnant women, elderly, African Americans, and those with pre-existing illnesses.7 Diluents are industrial solvents and degreasers, like dispersants, that act as an oil delivery mechanism, pulling oil into the body. The emerging science from the BP Gulf disaster is finding that chemically-dispersed oil is more toxic than oil alone to wildlife and humans. Since tar sands oil is concentrated with PAHs and VOCs/diluents, dilbit is far more toxic to humans and animals (wild and domestic) than conventional oil. The oil industry (and government) are trying to downplay the human health risks of exposure to tar sands and/or dilbit because this is extremely politically inconvenient information. It nonetheless is extremely dangerous. WERE RESIDENTS INFORMED OF THESE HEALTH RISKS? PROPERLY EVACUATED? This is simply not true. Oil and petroleum distillates (ingredient of both dispersants and diluents) wrecked havoc with wildlife and people in the aftermath of the BP disaster8 and the Exxon Valdez disaster.9 Similarly, tar sands oil and diluents made people sick in Michigan,10 where residents of one trailer court and neighborhood along the oiled riverbank blame exposure to tar sands oil and fumes for illness outbreaks including eighteen deaths––and counting.11 Oil and diluents can cause short- and long-term harm to health if people are not forewarned (educated about chemical illnesses, exposure, symptoms, and treatment) and given protection. Dilbit has a mandatory 1,000-foot evacuation zone. Was it uniformly enforced? In Michigan, people in richer areas were evacuated while people in poorer areas were either not evacuated or were forced to relocate when the city condemned public housing units.12 Enbridge housed workers in some of the homes it purchased, raising health concerns. If the home wasn’t safe for the original occupants, why was it safe for the workers? Unprotected workers and the general public are at risk of exposure and chemical illness. Children, elderly, pregnant women, people with pre-existing illnesses, and African Americans, in particular, and domestic animals should have been evacuated immediately. The local department of health should issue Public Health Advisories, warning residents of the signs and symptoms of exposure, such as headaches, nausea, vomiting, dizziness, nose bleeds, and cold- and flu-like symptoms, among others. Occupational and environmental medicine (OEM) doctors should be on hand to diagnose and treat illnesses that family doctors are not trained to recognize. These specialty physicians should NOT be provided by the industry; the city should hire them and ask industry for reimbursement. People should be given baseline health exams before returning to homes they evacuated; their homes should be tested for air quality. Wood and fabric, for example, absorb oily fumes and will off-gas over time. The industry should pay if homes, furniture, clothes, carpet, toys, etc., need to be replaced. WERE THE CLEANUP CREWS GIVEN AND WEARING ADEQUATE PERSONAL PROTECTIVE EQUIPMENT? Photos from KTHV in Little Rock, AR, show backhoe operators and others with absolutely no protective gear at all. Compare what the cleanup crews are wearing with what EPA and other federal responders were wearing, especially during the early response. During the Michigan response, EPA crews wore respirators and Hazmat gear. 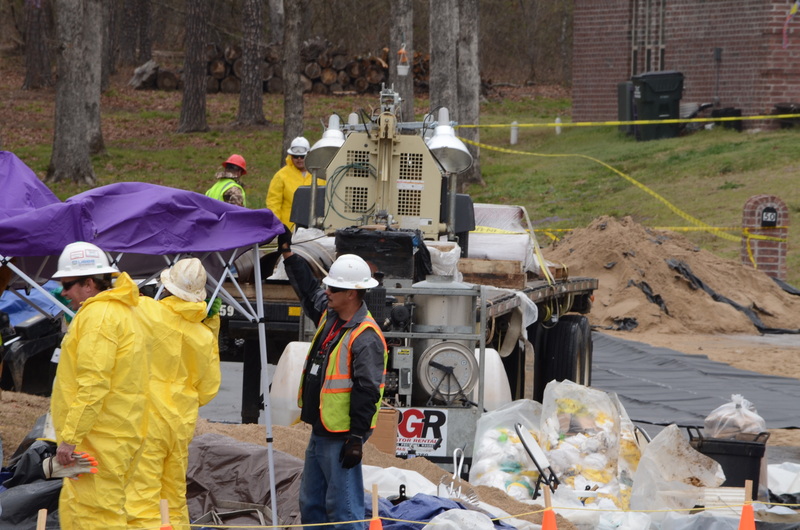 Hazmat crews with protective equipment and workers or the general public without similar protection in the same area is a sign of trouble for unprotected persons – and disingenuous PR statements. In Prince William Sound, Alaska, Alyeska’s SERVS workers are trained, provided with, and required to wear personal protective equipment, including respirators, during oil spill response. 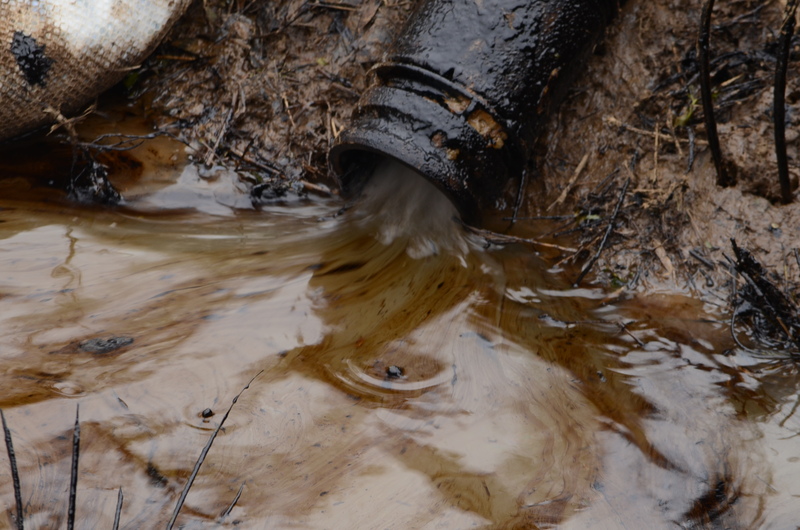 WHAT HAPPENS WHEN DILBIT AND/OR TAR SANDS OIL GETS IN CITY SEWERS? Photos from KTHV in Little Rock, AR, show dilbut bubbling down into storm sewers. City wastewater treatment facilities are not designed to process and remove even small amounts of oil. Individuals are fined hefty amounts for releasing even a quart of oil into sewers. Tar sands oil is thick, sticky goo and the diluents are extremely toxic chemicals. ExxonMobil needs to detail how it plans to help municipalities clean out the sewers and the wastewater treatment system––without contaminating the city’s water supply. If it is too late to avoid contamination of the city’s water supply, how will industry provide safe water for city residents? ARE TAR SANDS OIL AND DILBIT MORE CORROSIVE THAN CONVENTIONAL OIL? WHY DOES INDUSTRY CLAIM THERE IS SO LITTLE RISK? WHO PAYS THE COST OF SPILLS? WHAT DOES THE PRESS NEED TO DO? The government and industry are pushing the press away from these scenes with claims of safety concerns. Really? Are the media crews different from the workers or residents? The media could obtain and wear the same safety gear worn by the federal responders, if this is truly government’s concern. The BP Gulf disaster set horrible precedent for media access16––and the media acquiesced instead of insisting upon, and fully exercising, their First Amendment rights. THE MEDIA IS NOT GETTING THE FULL STORY IF THEY ARE DENIED ACCESS TO THE SPILL SITE––and neither are the American people. The ExxonMobil tar sands oil spill is very inconvenient for government, Congress, and industry. The U.S. State Department is taking public comment for the Keystone XL Pipeline until April 22. There will be a huge push by industry and the government to shut down the true risks and costs of transporting tar sands oil as inconvenient truths. It is the media’s job to accurately research and portray these risks to the public. 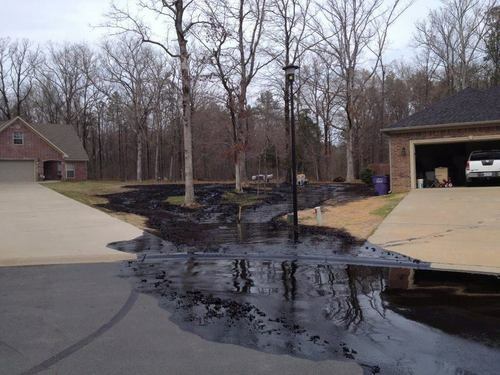 In-depth research and reporting on the ExxonMobil tar sands spill in Arkansas would be a good start. 3 See: series of Huffington Post blogs documenting emerging public health epidemic of chemical illnesses across the oil-impacted Gulf Coast at: http://www.huffingtonpost.com/riki-ott/; See also: on-line version of Sound Truth and Corporate Myths at: www.rikiott.com under reading for medical professionals. 11 Michelle BorlandSmith, Jackson, MI, pers. communication. 12 Michelle BorlandSmith, Jackson, MI, pers. communication. On Good Friday, an ExxonMobil pipeline carrying Canadian Wabasca Heavy crude burst in Mayflower, Arkansas and was discovered—not by the pipeline company—but by a local resident. According to the Canadian Energy Pipeline Association (CEPA), which referred to Wabasca as “oil sands” in a report, the “heavy crude” is a heavy bitumen crude diluted with lighter liquids (or diluted bitumen also called dilbit) to allow it to flow through pipeline. 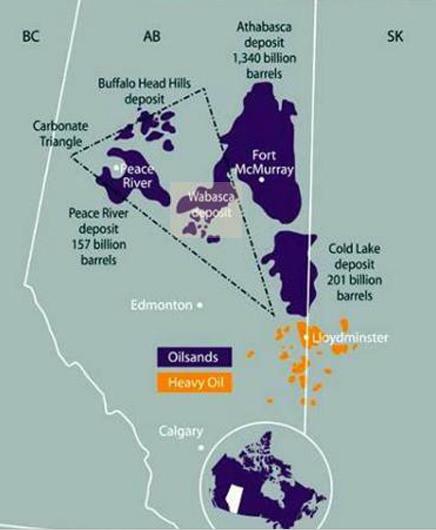 So we will be referring to the spill as oil sands to differentiate it from crude oil. Exxon Mobil Corp continues its efforts to clean up thousands of barrels of Canadian tarsands spilled from a 65-year-old pipeline in Arkansas, as a debate rages about the safety of transporting rising volumes of the fuel into the United States. The Pegasus pipeline, which ruptured in a community near the town of Mayflower, spewing oil sands across lawns and down residential streets, remains shut and Exxon didn’t begin excavating the area around the breach until Monday, a critical step in assessing damage and determining how and why it leaked. And no reports we have seen indicate the community was alerted to the potential health impacts the residents might experience. The spill has stoked a discussion about the environmental dangers of using aging pipelines to transport dilbit from Canada, as a boom in oil and gas production in North America increases volumes moving across the continent. The Pipeline and Hazardous Materials Safety Administration (PHMSA) said in a recent report that more than half of the nation’s pipelines were built in the 1950s and 1960s in response to higher energy demand after World War II. This is of particular interest to East Texans who may become host to hundreds of miles of re purposed Seaway pipeline that, like the Arkansas pipeline, passes near three major DFW water supplies. Environmentalists argue that oil sands are more corrosive to pipelines than conventional oil and that spills from these pipelines pose a risk to drinking supplies and the health of residents living near a spill. A 2010 Michigan spill resulted in residents being evacuated up to six miles away with more than 60% of the local population complaining of illness. (Source: Michigan Messenger,July, 2010) In a spill of oil sands, high levels of benzene and hydrogen sulfide go airborne requiring evacuation. A film crew from the DFW area doing a documentary on the Tarsands fight, that traveled with a group of Texans to the Climate Rally in DC in February, were quickly dispatched after the Arkansas spill was discovered. They have shared with environmental groups that while filming in a local elementary school not far from the spill, numerous children at the school were reporting bouts of vomiting. Children living near the Michigan spill reported cases of vomiting, upset stomach, shortness of breath, lethargy, headaches, rash, irritation with the eyes, sore throat, and cough withing the first week. Adults experienced migraines, eye irritation, sore throat, nausea, and coughing, and pets suffered from continuous vomiting and diarrhea. While the pipeline company told residents that they couldn’t prove that the pipeline spill was the cause, the EPA established that there were 15 parts per billion of benzene in the atmosphere in the region of the spill, which is roughly three times the standard established as safe for human exposure. And to add insult to injury, this community found out after the fact that, while companies that transport oil are required to pay into the Oil Spill Liability Trust Fund, giving the government a pot of money for immediate spill responses, the Enbridge pipeline in Michigan and the Exxon pipeline in Arkansas, are exempt because these pipelines are not considered to be carrying “conventional oil”, despite the fact bitumen spills are more expensive and more dangerous. So after 3 years, the Michigan spill is far from being cleaned up, and the long term affects of exposure to the toxins released from the spill won’t be known for years. We can only anticipate that the Arkansas community will experience similar issues in cleanup efforts and Little Rock will wait to see if there are going to be impacts on their water resources. Texans along the pipeline routes have expressed many of these concerns over the past year fighting the tar sands pipeline companies that want to run these through their lands and here are a few things that they have learned. Emergency response plans are only required after a pipeline company begins operations, not before. Pipeline testing is self-determined by industry for both new and re-purposed pipelines. The Railroad Commission has few inspectors to check pipeline integrity. Companies only propose flyover inspections of these lines every two weeks. Pipelines travel through rural areas, are considered low consequence, so are not given the same safety considerations as more populated, high consequence areas. Computerized detection system tout spotting pipeline problems within 10 minutes, but this has failed with both new and re-purposed pipeline spill detection. I certainly don’t feel like the government has my best interest at heart looking at these failures to protect the citizens of Texas and other states along these pipeline routes. We will be watching this one. The Texas Progressive Alliance hopes everyone has a Happy Labor Day, and notes that it won’t be any work at all to read this week’s roundup of blog highlights. Neil at Texas Liberal made note of elections in Japan. These elections have moved Japan to the left and possibly changed politics in Japan for years to come. Off the Kuff discusses the latest entrants into the Texas Governor’s race. Mayor McSleaze at McBlogger takes a look at the BARACKNOPHOBIA gripping a small minority of the people in some parts of Texas. The Texas Cloverleaf announces its intention to not run for Governor. CouldBeTrue of South Texas Chisme wonders why SMU is still supporting a Bush policy institute. Isn’t that like the Larry, Moe and Curly institute of higher learning? Felix Alvarado’s problems managing his checking account are a precursor of bigger troubles ahead for Texas Democrats in 2010, reports PDiddie at Brains and Eggs. Dembones at Eye On Williamson posts about the latest craziness from the crackpots in our country, More fake outrage from right wing astroturf. Over at TexasKaos, Libby Shaw helps out understand the latest right wing melt down in his posting The Right Wing Goes Ballastic Again . If their unhinged outrage leaves you scratching your head, check it out! WhosPlayin readers divided their time between rallying for health insurance reform and standing up to the Lewisville ISD’s silly decision to BLOCK the President’s speech from its classrooms.